While poking around on the Internet to see if anything new had popped up on some of my favorite ducted turbine projects I came across some videos of FloDesign-Ogin that I hadn't seen before. The first is the most interesting: 100 KW Ogin wind turbine drone footage. Posted by Stan Tehee on Dec 30, 2016 it appears to show drone footage of then recently installed prototype of the second generation FloDesign-Ogin DAWT in the Antelope Valley near the southern border of the Tejon Ranch. I've written about this turbine before. See FloDesign-Ogin Diffuser Augmented Turbine (DAWT) in the Wild. Unfortunately, my photos were taken some distance from the prototype. 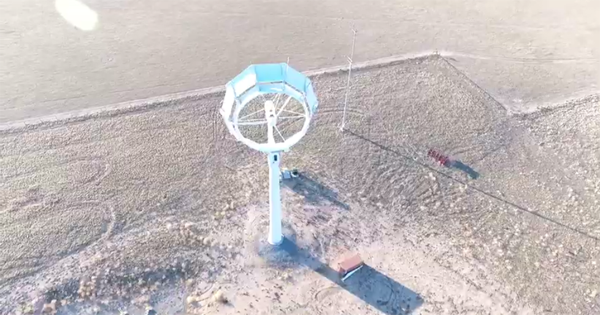 Tehee, a wind turbine technician, either was involved in the installation of the prototype or otherwise gained access to the site on private property to fly a drone and shoot video of the ducted turbine. These are best up close and personal images of this version of the design. FloDesign-Ogin went bust sometime in 2016, taking a lot of investors' money with it. I also came across another video, this one of FloDesign Experimental Wind Turbine on Deer Island in Boston Harbor. This is a video of the original design before it was modified for installation of a prototype second generation version in California. By the spring of 2017 the city was going out to bid for removal of the turbine. The defunct company walked away from the turbine, leaving the taxpayers to dispose of the aerial junk. For more on this il-fated DAWT, see FloDesign-Ogin.